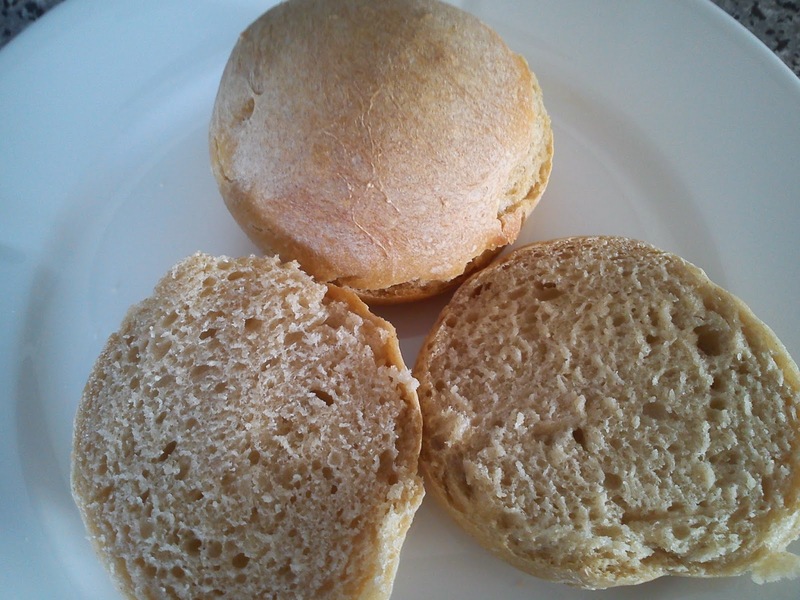 Why do I call these buns "Three flours buns" ? Well I am using the different types of flour for the creation of these buns, as it gives me the option of using rye flour, which otherwise would stand in my kitchen without any purpose. As usual after baking I am freezing the majority of the buns, so I have a stock of buns, which easily can be de-frosted in the micro-wave oven and turned into a "look-a-like" warm bun directly out of the oven after baking. Instead of buttermilk you could use plain tap water, but I had some buttermilk standing in my refrigerator, which I needed to use instead of throwing it out. First add the yeast, flours and salt into the mixing bowl of the mixer. Start to whip on low speed, slowly add in the buttermilk, water and honey. Knead the dough on the mixer for 10 minutes. After the kneading process, let the dough raise cold night over. Divide the dough into equal size buns, I always a kitchen scale for this purpose in order to ensure equal baking of the buns, I target a dough amount of 80-90 g per bun. Place the buns a baking tray covered with baking paper, and let the buns raise for another 45-60 minutes. Bake the buns at 200'C for 30 minutes in the middle part of then oven. What to, when you have ½ l of dairy whipping cream looking at you with "angry eyes" from the refrigerator with an overdue date of 2 days !!!! Well the first step is to sniff to the cream, does it have a sweet cream flavour or is it having a strange unwanted flavour. The flavour was excellent, so I decided to make two portion of different soft boiled caramels, twisting recipe on soft boiled caramels by Mette Blomsterberg. It took me a total of 1 hour to some my overdue dairy cream into some excellent tasting caramels, this portion with orange and a new portion of liquorice caramels. For some reason I wanted to make caramels with orange using the zest of orange combined with 4 drops of citrus flavour. I added the orange zest and citrus flavour after, that the caramel mass had reaced the temperature of 121'C. Another time I will add the orange zest into the caramel mass during the cooking process. Still the flavour addition should first be done at the cooking is done, as the flavour can disappear during the cooking step. I also decided to fill the caramels into individual serving size during the filling after the cooking, as this is much more easy, so you do not have to cut and pack the caramels after the cool down. However, you should do, what you prefer to do ! Stir very well during the heating process of the caramel mass, until the temperature reach 121'C. Add in the orange zest and citrus flavour and stir very well. The caramels will start to look like a volcano due to the liquid in the orange zest. 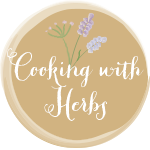 For the monthly blog challenge Cooking with herbs runned by Lavender and Lovage mint was selected as theme for April. 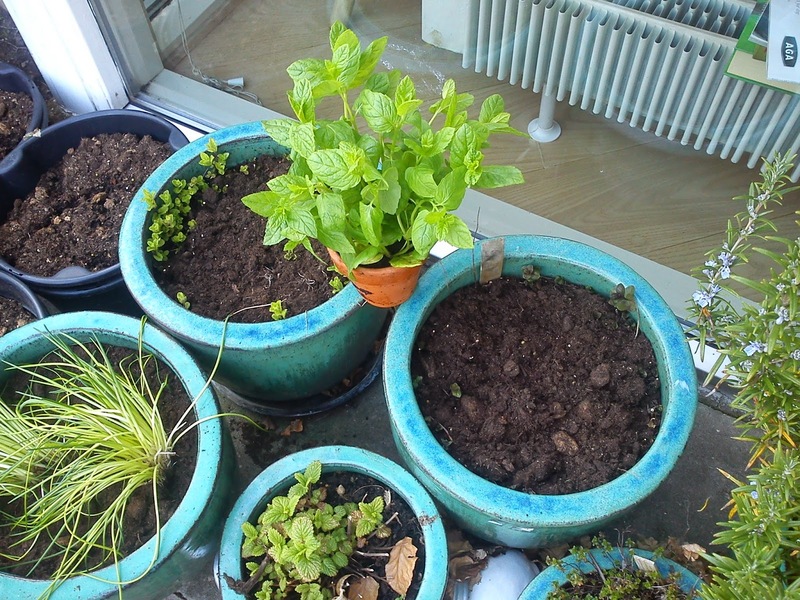 I love mint as a herb, and I actually have two mints in my garden herbs, but even here in the end of April, they do not show a lot of growth. So it ended with, that I went to the supermarket to but a pot of green mint, so I could participate with my contribution of making Moroccan style mint tea. I enjoyed it, when you can end a Moroccan style meal with a sweet cup of mint tea. And I will making it, the way I have experienced eating Moroccan food in Paris. This mint tea can be enjoy both hot or served ice cold on a warm Summer day. 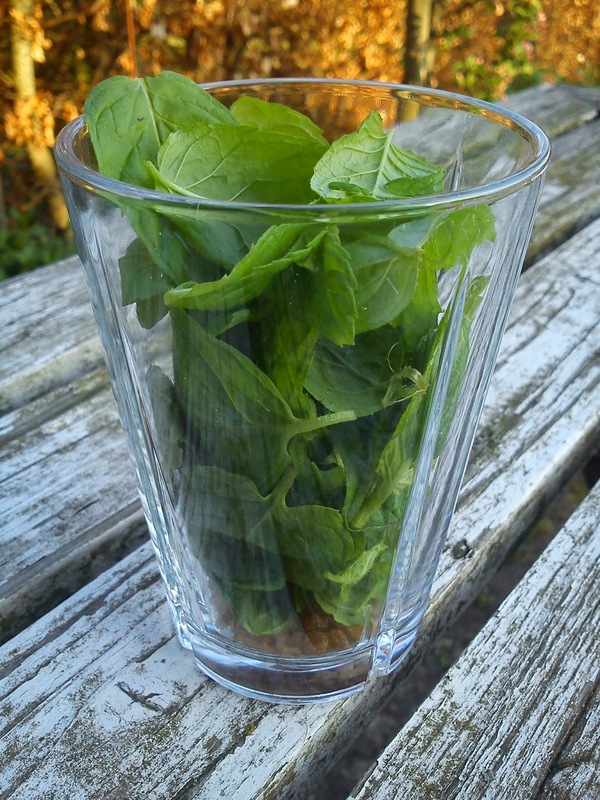 Fill the glass with mint leave and plenty of sugar. Pour boiling water over the mint leaves. 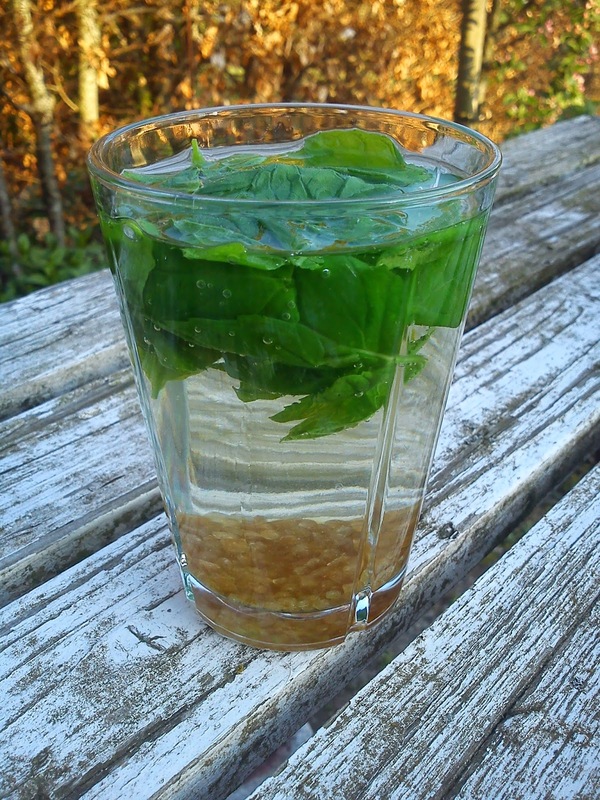 Let the mint leaves infuse the water for 3-5 minutes, before you can the first sip. Leave the mint leaves inside. Soft boiled liquorice caramels from "Det Søde Liv"
Well my colleagues really liked the taste of these liquorice cream caramels, but they found them to be too hard boiled. After contact to the caramel expert at work, I was advised to lower the cooking temperature from 137'C to 121-122'C, as this would give the caramel texture instead of the texture of a hard-boiled candy. I recently saw Mette Blomsterberg in "Det Søde Liv", where she made caramels, so I decided to try out her recipe on Det Søde Liv - bløde lakridskarameller. Well, the texture is right, but the taste of liquorice has nothing to do with liquorice, as the liquorice powder is located on the outside of the caramels. Also it is tricky to divided the caramels after the cool down period into equal size. And on top of that, you have pack each individual caramels into cling film. Next time I will go back to fill the caramels into individual portions from the very beginning. And I would advise you to stir these caramels very frequently, as they have an tendency to burn. Perhaps an increase in the butter amount could reduce the burning ? Fill the caramel mass into form covered with baking paper coated with flavour less oil. 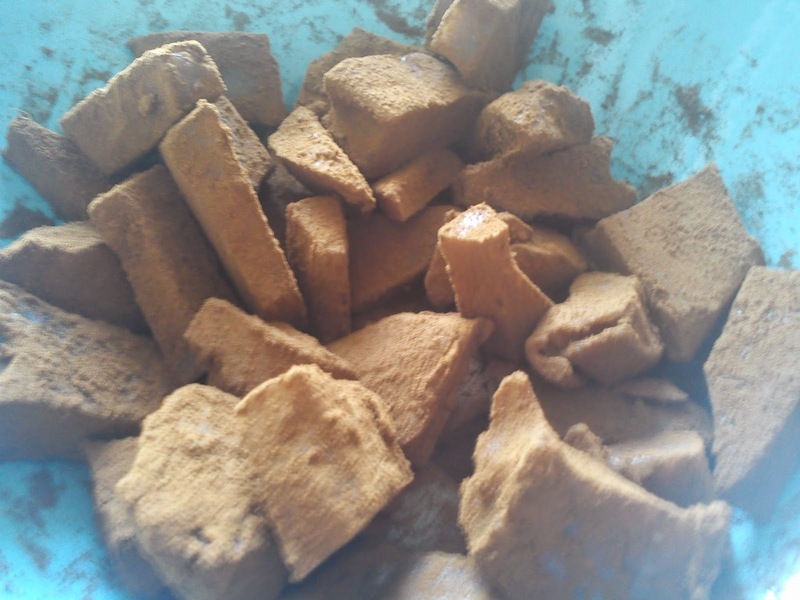 Cut the caramels into smaller squares, which is placed into English liquorice powder for dusting. 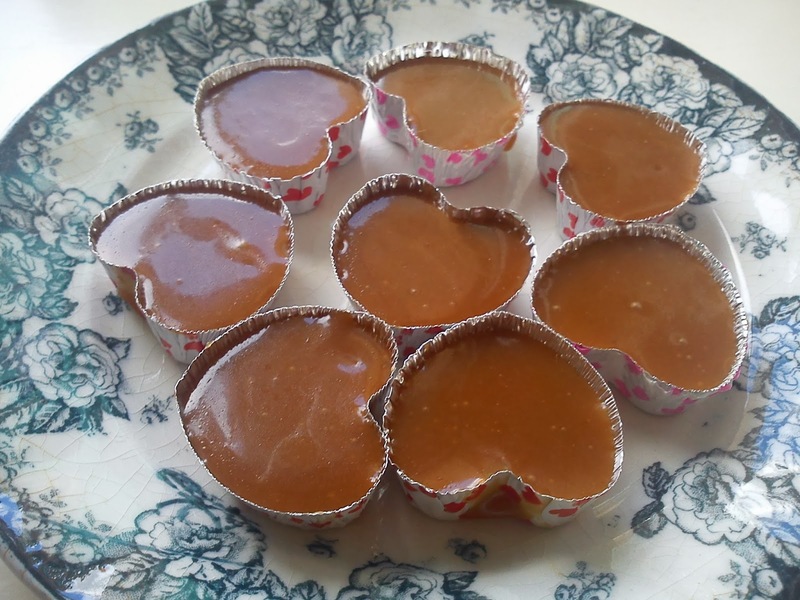 Pack each individual caramel into cling film. 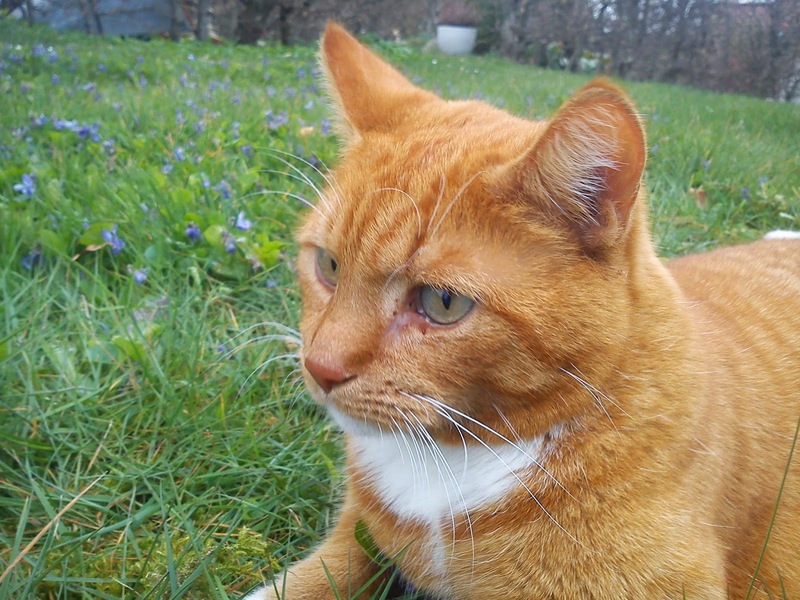 Today it is Easter Monday and it is the last day in the Easter vacation. 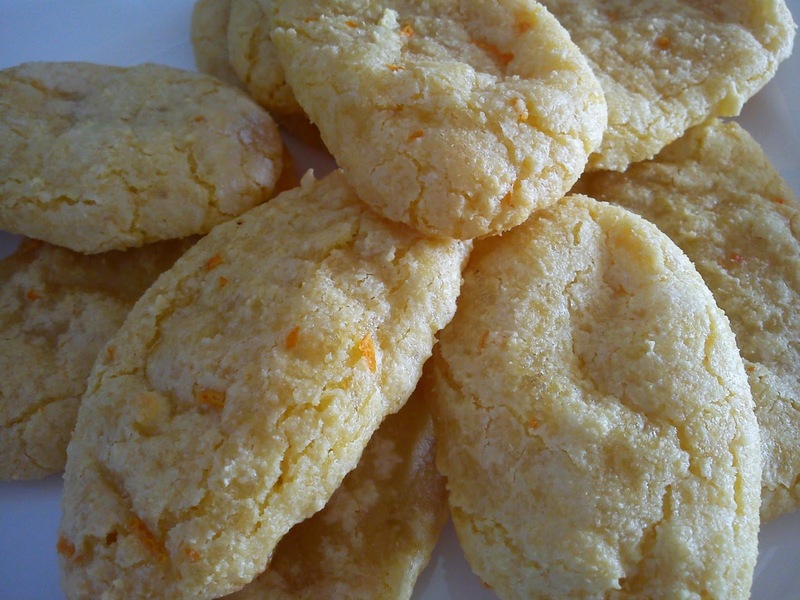 I have located this recipe on Hot Cross cookies on the blog What Kate Baked. And it gave me a great opportunity to empty my kitchen cupboards from various leftovers from my Christmas baking. 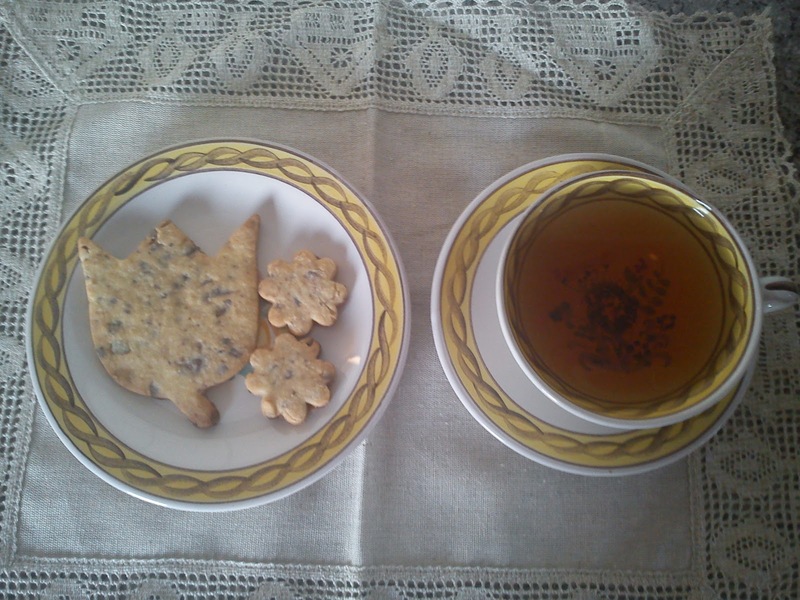 In Denmark we have a saying: "Christmas lasts untill Easter", so I knew, that I had to bake these cookies. 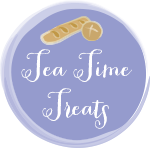 And a huge thank you to Kate for sharing this recipe with us as reader and writers out here in blog land. Heat up the (conventional) oven to 180'C. Beat sugar and sugars together for 2-3 minutes using an electrical mixer. Add the egg and whip again into a homogenouse mass. Stir in the flour, spice and bicarbonate of soda by hand. Stir in the raisins and dried fruit. Form the cookie dough in a rounded ball with the size of checnut. Cover the baking tray with baking paper. Place the cookie dough with big distance between each cookie ball. Bake the cookies in the upper part of the oven at 180'C for 15 minutes. 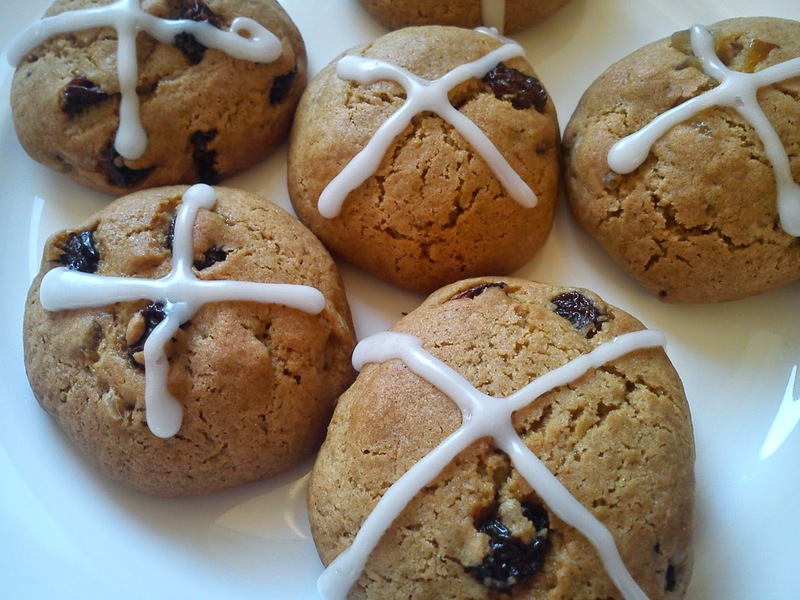 Cool down the cookies, before decorating them with sugar icing with the shape of a cross. Store the cookies in an airtigth container. Well in case you have receiced no Easter egg here in 2014, you can make your own Easter egg, which you perhaps will share with some friends and family members ? These Easter eggs are very simple to make and they take no time to make. Divide the orange marzipan into 5 pieces. Shape the marzipan into egg shape using your hand. Melt the white "chocolate" coating. 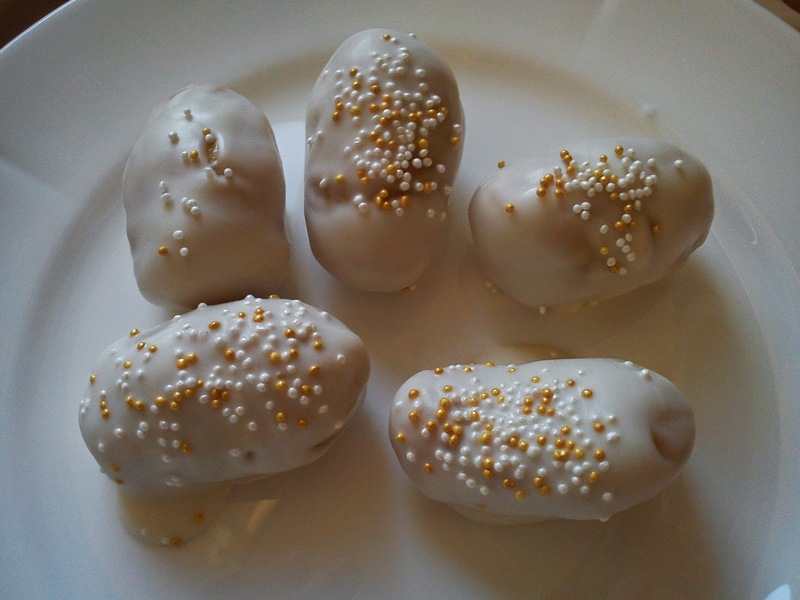 Dip the marzipan egg into the melted white coating. Place the eggs on baking paper for drying. As the coating is drying quiet fast, you need to sprinkle the coating fast with small sugar pearls. 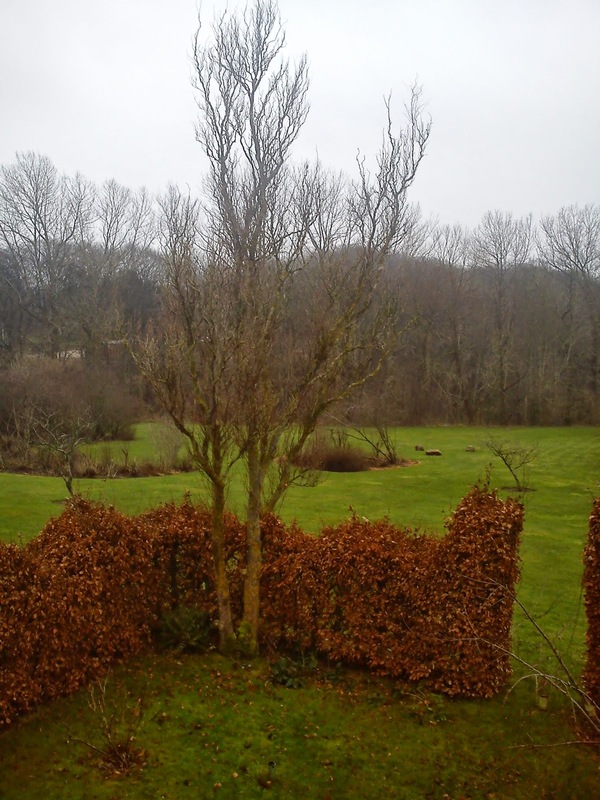 Today is Easter Saturday, being the third day of the Danish Easter vacation. And today it is time for making your own Easter tea. 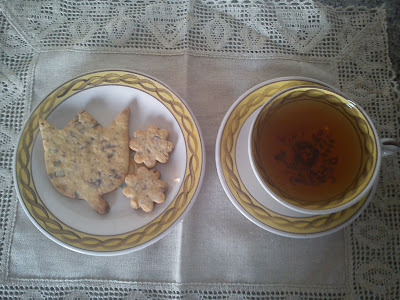 Instead of using various spieces as done in Christmas tea, I decided to use the approach, when making this Elder flower tea. As the violet petals are dry, where was no need for drying them, before mixing them with the tea. Let the orange peel dry for 2-4 hours on top of a warm radiator. Remove all the petals from the violets. As they seem to be dry, where is no need for drying them. 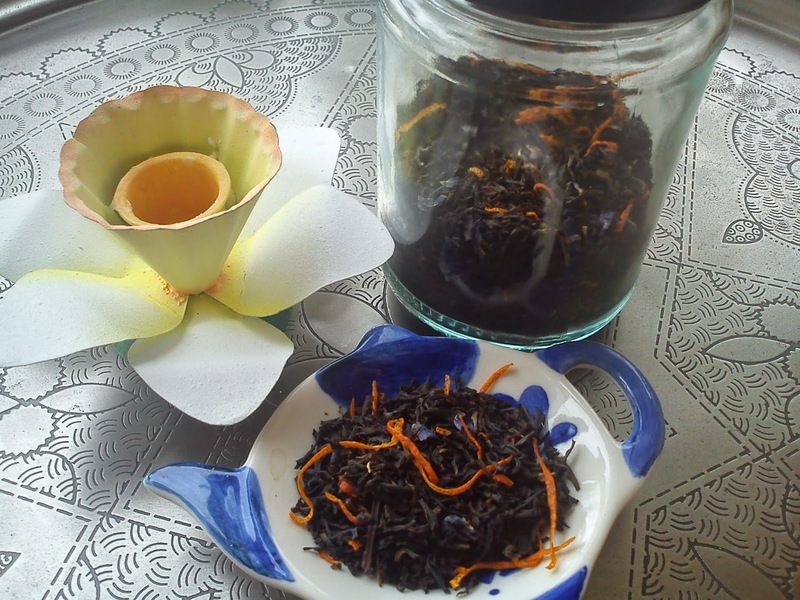 Mix the tea with the dried orange zest and violet petals together in glass, which is air tight. Let the tea stand for a few hours, before making the first cup/pot of tea. Today being Good Friday it is time to make a new version of last year´s Easter Lamb my last Easter creation in my kitchen. To adjust the taste for 2014, I decided to add into some lemon zest. However, I still find the taste and texture to be to plain, so I have no cracked the code for the Easter Lamb yet, it gives me the options of coming up with a new suggestion for Easter 2015 !!! Divide the egg into egg yolk and egg white. Beat the egg white into a stiff foam. Whip the egg yolk, lemon zest, water and icing sugar together into a white and foamy mix. Afterwards whip in the baking powder, vanilla sugar and flour. Gentle stir in the egg white foam, little by little, as the cake mix is quiet firm. Brush the Easter lamb form with melted butter or oil. Fill up the Easter lamb, until it is 75% filled. Bake the Easter lamb in the lower part of the oven at 180'C for 45 minutes. Let the Easter lamb cool down, before you take it out for the form. Today it is Maundy Thursday (Skærtorsdag), which is a public holiday here in Denmark and starting off the Danish Easter vacation with 5 days off from work. And at the same time it is the start for my little Easter Calendar 2014, where I every Easter day will be sharing a new recipe having a relation to Easter of some kind. 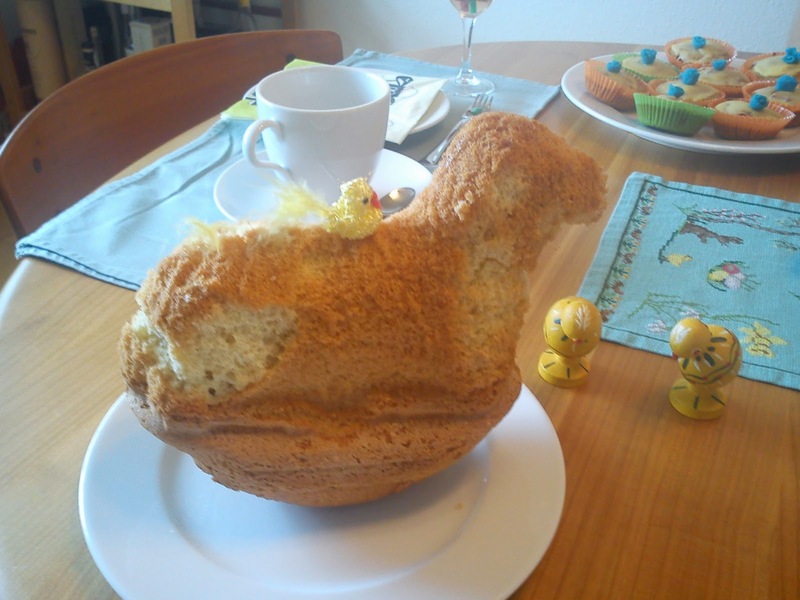 We will start off with a new thing, which is marzipan cake called fuglereder a la Odense Marcipan (bird nests), which is very fitting with busy birds outside finding a new or old mate to court with, building a nest to be filled with eggs. I must admit, that I got a little anoided, when I noticed that the packaging of baking stable marzipan (being a part of my goodie from Odense Marcipan) only contained 300 g instead of the 500 g baking stable marzipan stated in the recipe !!!! 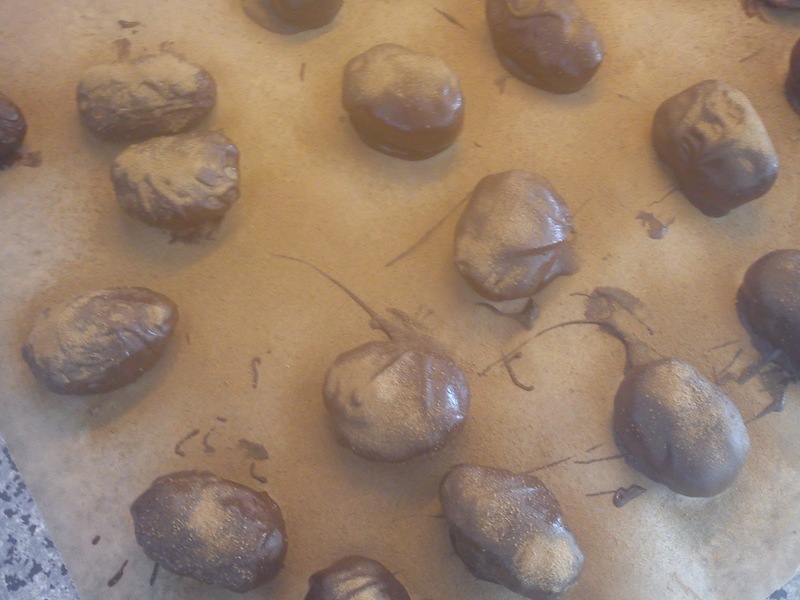 So I went for a combination of baking stable marzipan and tradtional marzipan with 63% almonds. And I got not noticed any defects in these cakes !!! Heat up the (conventional) oven to 210'C. Knead the marzipan together with sugar and egg white in a mixing bowl. I use my hand for this purpose. Form the marzipan into a roll, which is divided into 15-20 pieces of equal size. Roll the marzipan into sphere, which is rolled in finely chopped hazelnuts. Place the marzipan sphere on a baking tray covered with baking paper. Make a hole in the marzipan sphere using a fingre. Bake the marzipan cakes in the upper part of the oven at 210'C for 10 minutes. 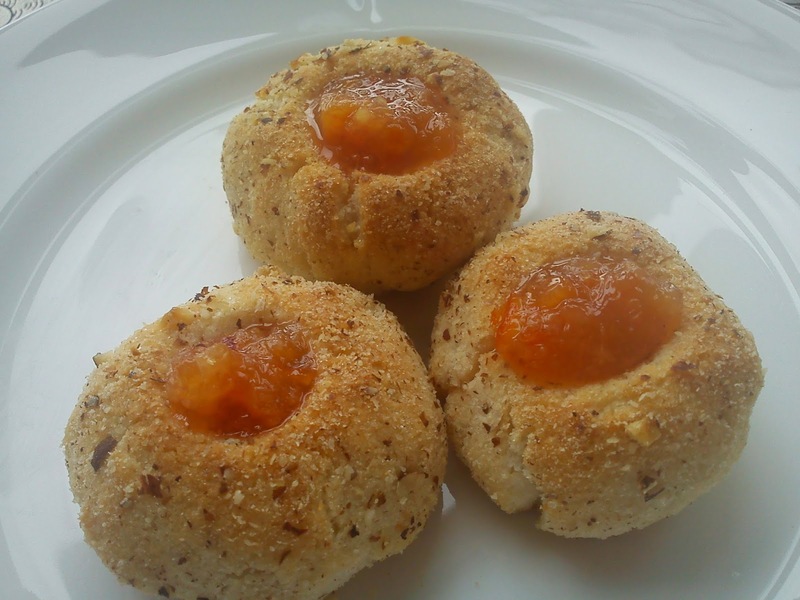 Before serving the marzipan cakes fill the hole with blood orange jam or plain orange jam. 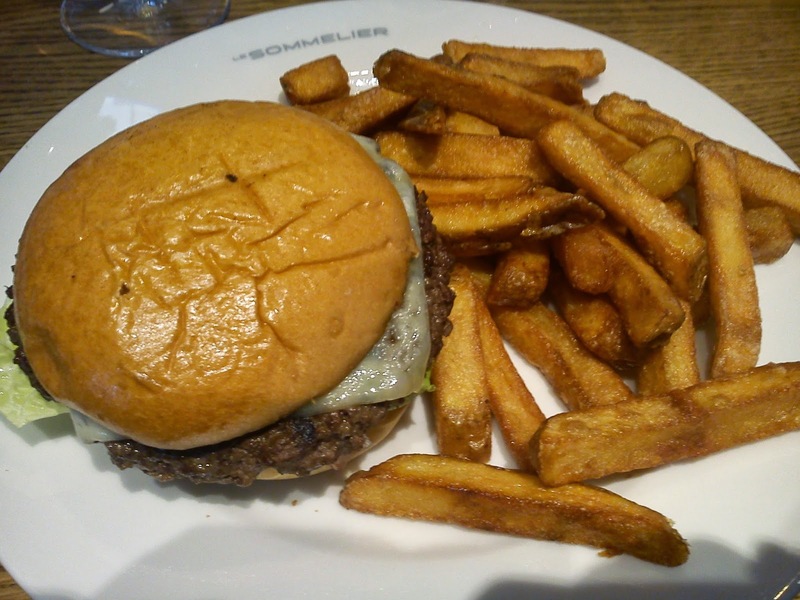 This picture of the burger being served at Sommelier located in Copenhagen Airport is not very colourful, however the taste is excellent. I normally eat my lunch here, when I am having the time for that in the airport, as you can sit a little away from the busy walking areas and relax on your own. I really like, that you are being asked how much the meat part of this burger should be cooked such as medium or well done. The burger bun is not enormous, so you have the felling you are eating more bread than beef. And the fries are worth killing for, as they has the right texture without any raw centre and a good tasty level of salt. The burger is served with tomato ketchup, mayonnaise and green pickled chilies. I paid 313 DKK for one burger, a glass of white wine, a small soft drink and a cup of black tea. I will give this meal 4 stars. Stop worrying, I actually eat break, lunch and dinner very single day, but I am not posting that many recipes on my dinners, but now it is time for share a main course recipe with you. This recipe can easily be eaten and enjoyed over more evenings, if you make own big portion.This original recipe (kalkungullash med svampe og druer på knuste kartofler) is found among various recipe on evening dinners at Fakta. However I have made a few adjustments on the amount of some of the ingredients. 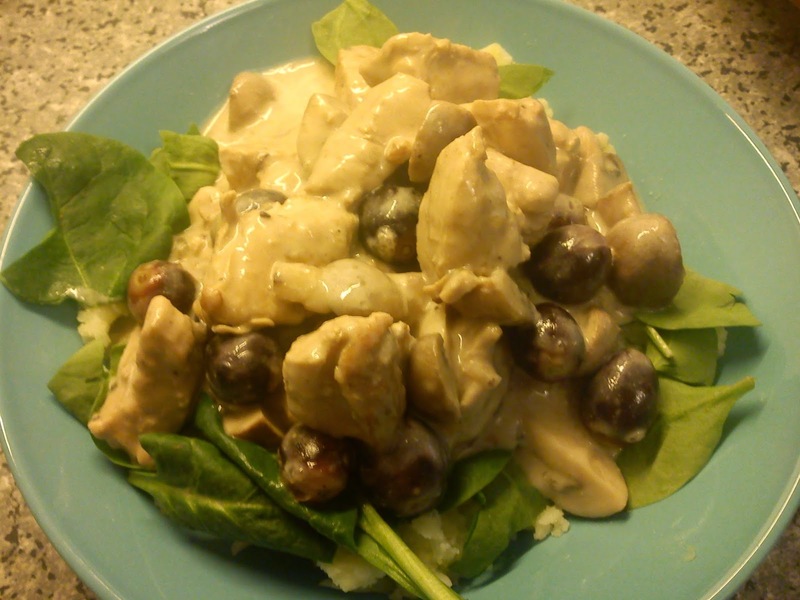 I really like the use and taste of juniper in this dish, and the variation in texture coming from the grapes, mashed potatoes and spinach leaves. Fry the onion in the hot olive oil in a big cooking pot. Season with salt, pepper and masked juniper. Add in the vegetable stock, and lets everything simmer for 5 minutes under lid. Add in the sour cream and bring it to the boiling point. Add in the mushrooms and let the dish simmer for 40 minutes under lid. Add in the grapes and let the entire dish simmer for 5 minutes under lid. Mash the potatoes without any addition of milk and butter as usual for mashed potatoes. Fill mashed potatoes as bottom layer, followed with spinach leaves and top of with the turkey gullash. After a brisk walk from the hotel to the Red Square, Moscow and back again (8 km in 1½ hour) during a recent business trip to Russia, I decided to eat at the hotel instead of walking around to find a place to eat. 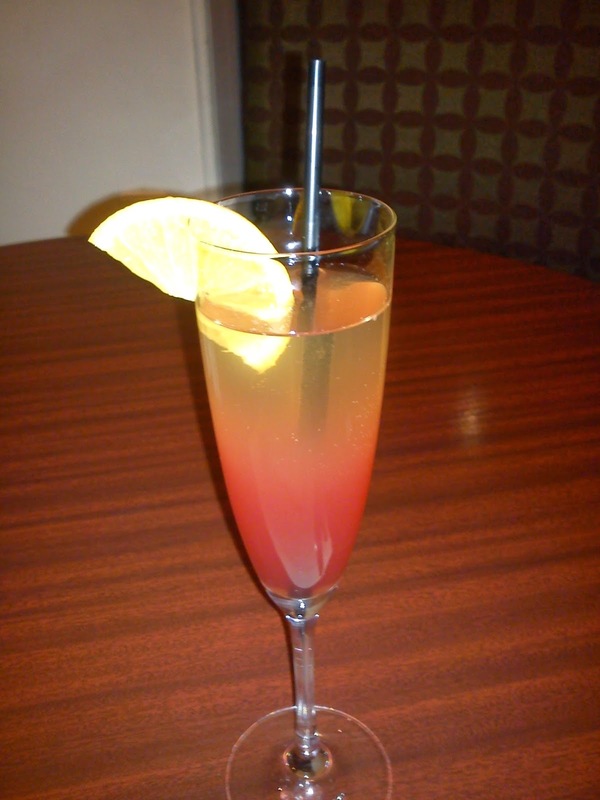 I started off with a cocktail called Flamingo, which was champagne, Cointreau and cranberry juice. It is not an over sweet cocktail probably due to the use of cranberry juice. Perhaps I should create my version in my kitchen ? The menu card at the restaurant of the Marriott Tverskaya had marked the Russian food with small Russian flags, so they could easily be located among the various options. I went for the Russian food a bit like do as the Romans, when in Rome !!! Therefore I choose blinis with red caviar as starter, as I am huge fan of blinis with red caviar. The important thing is, that you always remember to make a small tasting of the sour cream, when eating in Russia, before you spread it on this blinis. And also in this case, the sour cream was rancid in the taste, which is a awful off-flavour. 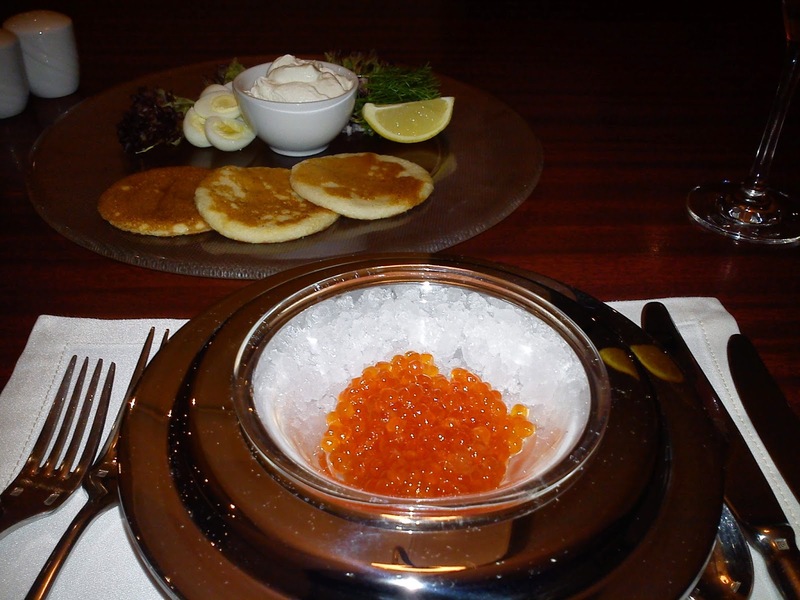 I enjoyed the blinis and red caviar without destroying my taste buds with the sour cream. 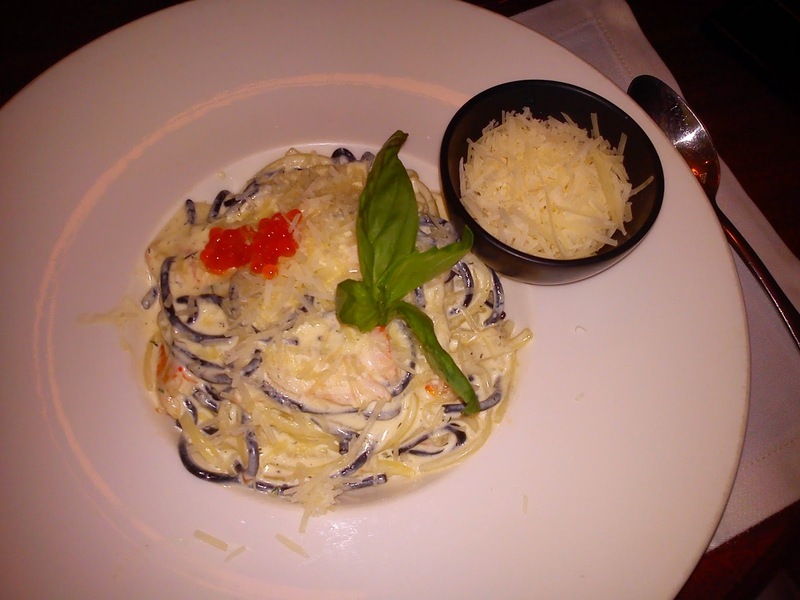 As main course I had selected pasta in white and black colour in cream sauce, cray fish and yet some more red caviar. However, this dish was a disappointment for me, as the amount of red caviar was only a few eggs and the rest of the dish was heavy in consistency coming from the cream sauce. I do not recall the price for this menu. I will give this meal 3 stars and remember to stay away from the Russian paste dish another time. The blinis and red caviar as excellent. As mentioned previously I, well my participant, made it all the way to the final in the TV programme "Danish Idol" (X Factor) and became second in the final. Therefore I had to bring marzipan cake for our celebration at work. Instead of baking a more traditional marzipan cake from marzipan, icing sugar and egg white, I decided to jump into spring mood making orange flower marzipan cake :-) I have already share the recipe on mint chocolate marzipan cake with you, which I made as well for this celebration occasion. Your contribution is to leave a comment on what your favourite flavour combination within Easter egg is, regardless of this Easter is home-made or not. I will at the end of this week draw one lucky winner among all the received comments fulfilling the above stated requirement. You can leave your comment in either Danish or English depending on your preferred language. On my last give away I received two comments for a total of two gifts, which means you will have an excellent chance to win and get hold of this gift, if the trend with few comments continue. The winner will be selected at random from all comments received full-filling the above mentioned requirements. The winners will be notified within 1 week after the closing date. The price is as stated, so no cash alternatives are available. This give-away is open to EU + Nordic countries entrants only. The closing of this Springtime give-away is Sunday 13 April 2014 at 20.00 (CTE time zone). 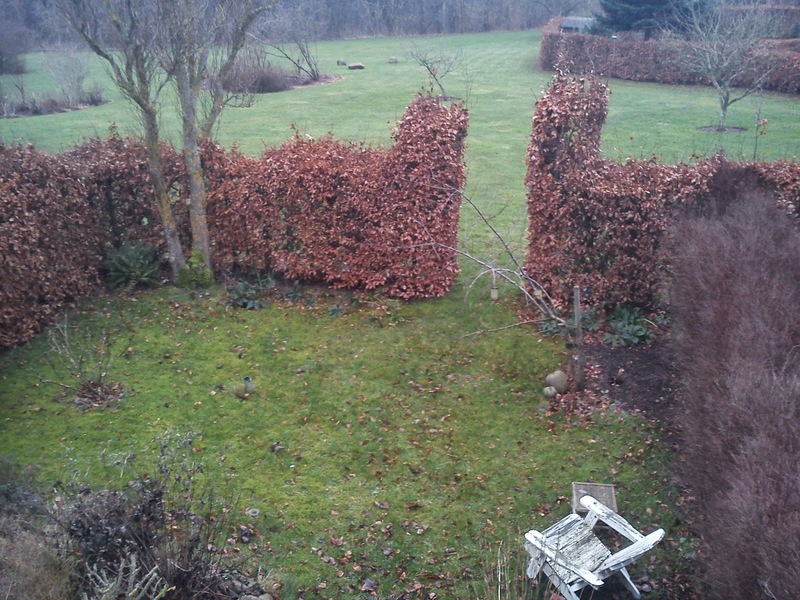 :-) Præmien er den fantastiske bog (Kager, desserter & konfekt med hjertet), hvor hovedingrediensen selvfølgelig er marcipan. Bogens tekst er dansk. For at deltage, skal du efterlade en kommentar på , hvad din favorit smag kombination indenfor påskeæg er, uanset dette påske er hjemmelavet eller ej. Jeg vil i slutningen af ​​denne uge trækker en heldig vinder blandt alle de modtagne bemærkninger, som opfylder det ovennævnte krav.Du kan efterlade din kommentar på enten dansk eller engelsk , afhængigt af dit foretrukne sprog.På min sidste "give away" modtog jeg to kommentarer til i alt to gaver , hvilket betyder, at du har en fremragende chance for at vinde og få fat i denne gave, hvis tendensen med de få kommentarer fortsætte .Vinderen vil blive udvalgt tilfældigt fra alle modtagne kommentarer, som overholder kravet. Vinderen vil blive underrettet inden for 1 uge efter fristens udløb . Prisen er som anført, det er ikke muligt at modtage kontanter i stedet for den udlovet præmie. Denne give-away er kun åben for bloglæsere indenfor EU + Norden.Afslutningen for ​​denne Springtime give-away er søndag 13 April 2014 kl 20.00 (CTE tidszone) . I can hear the comment, which my good girl friend in Horsens will make when she reads this blog post: "You are again being ottomok !!" 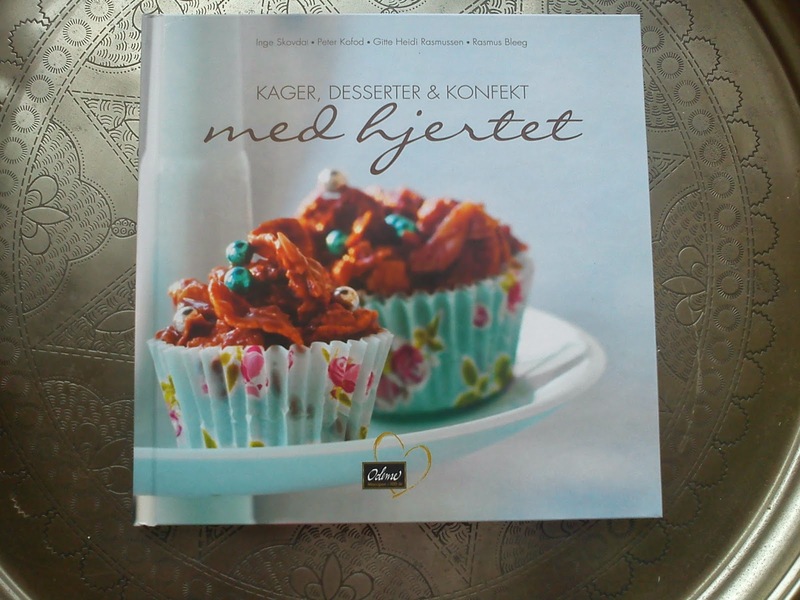 I have found the originale recipe on the pearl otto in seasonal free food magazine called "Sæson for god smag", issue 3/2013. However, as I only had half of the need amount of tomatoes and had a surplus of brown mushrooms and red pepper fruit, I made several modification. 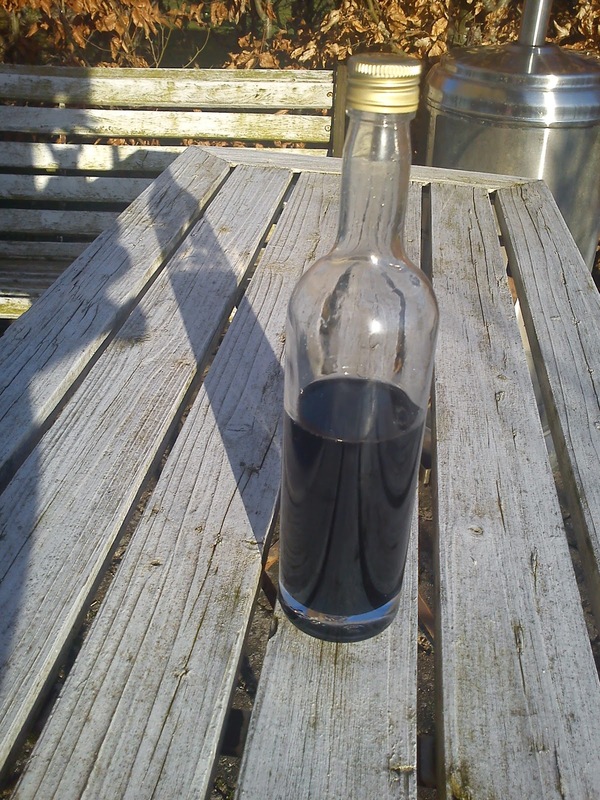 Also the amount of vegetable stock was reduced, as the pearl barley could not adsorb more vegetable stock. Heat up the oilve oil in a big cooking pot. When hot add in the onion, garlic and mushroom and let them fry. Afterwards add in the pearl barley and fry them as well for 2-3 minutes until they have a golden colour. Pour in the white wine and let it e absorb by the pearl barley. 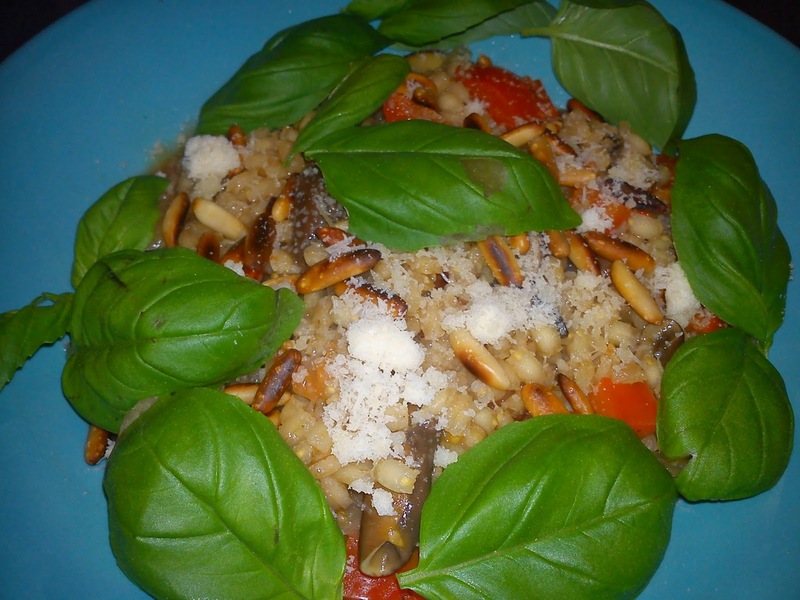 Gradually pour in the vegetable stock and let it be absorb by the peral barley. This takes approx. 20-25 minutes, where you have to stir on a regular basic. Add in the diced tomatoes and pepper fruit and let the pearl otto simmer for another 3 minutes. Served the pearl otto topped of with Parmesan cheese, basil leaves and roasted pine nuts. Served together with a glass of white wine. A few weeks ago I was on business trip to Moscow. This time I was soo luckily, that I had the time for fast stroll from the hotel to the Red Square, as I was staying 4 km away from the Red Square, so I took on my fast shoes and walked in 45 minutes enjoying the sunshine in the middle of March. On top of the good and beautiful walk I also went to dinner with some good colleagues in a nice restaurant, where I have forgot the name, but I am able to find the location again on my own. 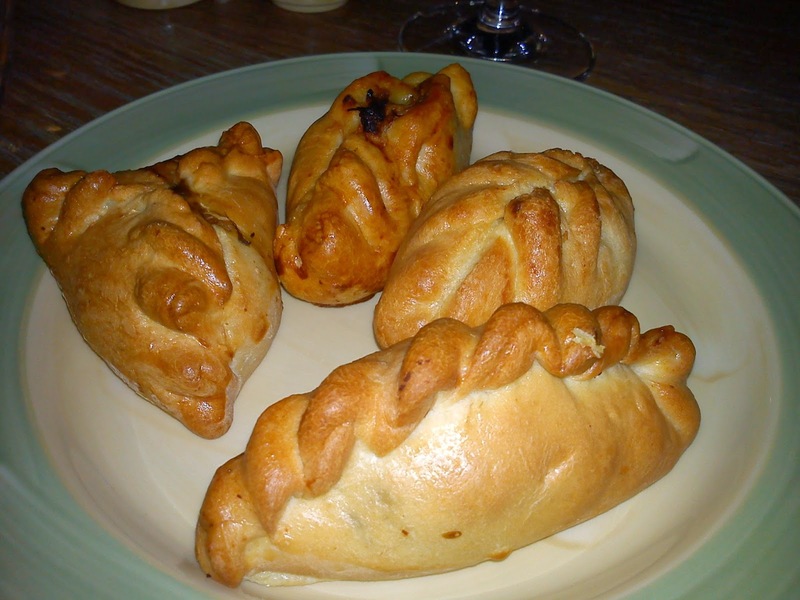 The other starter was small pirogs with fillings of either with meat, mushrooms, cabbage and potatoes. 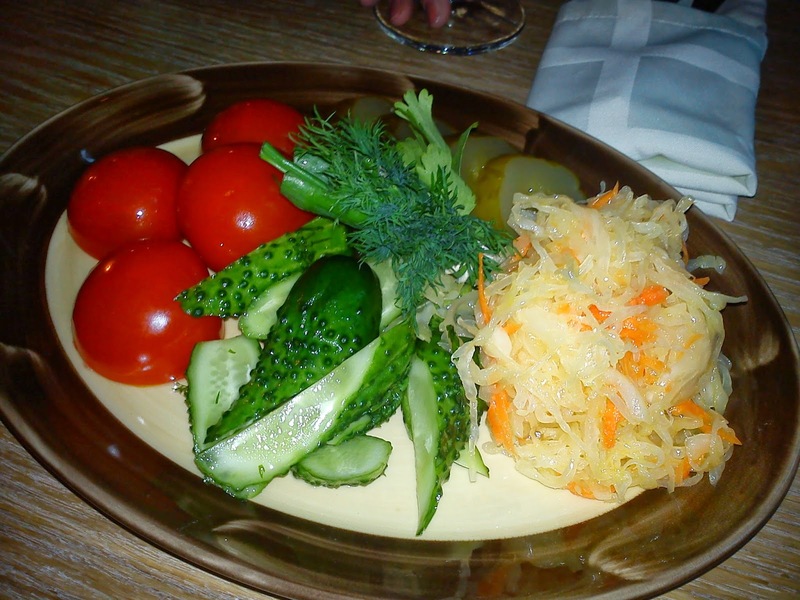 An OK starter, but the freshly pickled cucumbers was just soo much better in my opinion. As main course I decided to have "Strogannov", which has been one of my favourite dishes since childhood. And mu mother is very good in cooking this dish, so I have never made it myself ! 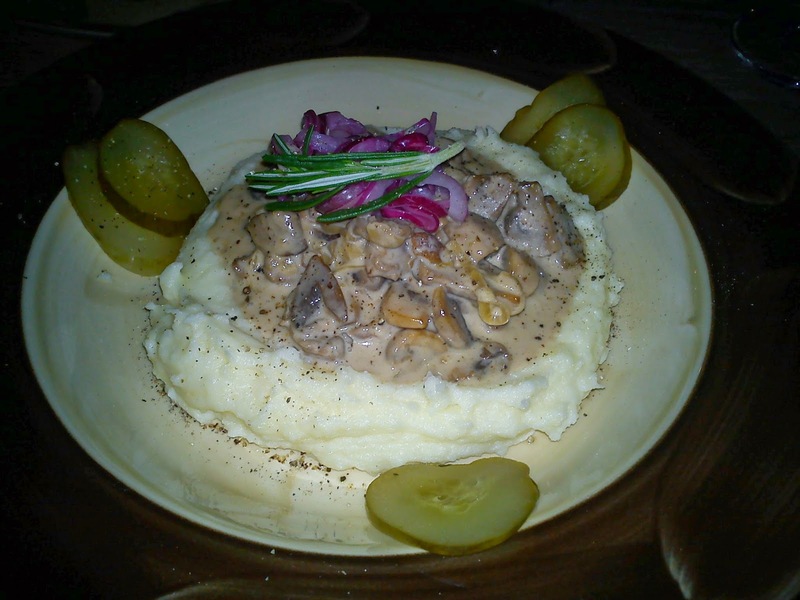 The "Strogannov" made with veal, white mushrooms, mashed potatoes and cucumber in barrel. The taste was great, the mashed potatoes was home-made and the combination with chopped red onions was a nice flavour combination, which I will try myself in my kitchen. 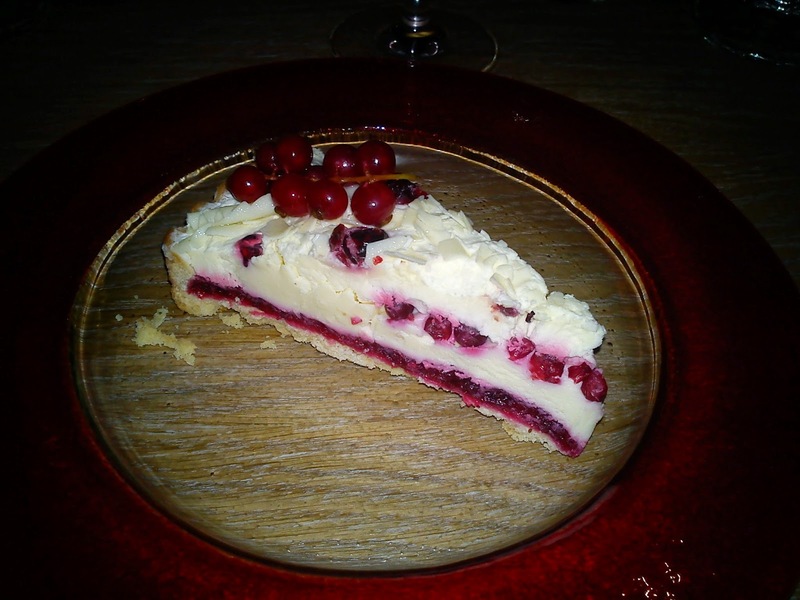 As dessert we had cranberry cake with white chocolate. Again an OK cake, but nothing extraordinary. I have no clue, what the price was for this meal, as I was not paying for it. I will give this meal 4 stars and I am ready to go back again, if I am in Moscow on a later occasion. Hjertebrød - heart bread from "Hjemmebagt"
Suddenly I am in a strong current baking various recipes from the wonderful bread book called "Hjemmebagt" getting closer and closer to the magic step, where I have managed to bake me halfway through the book. 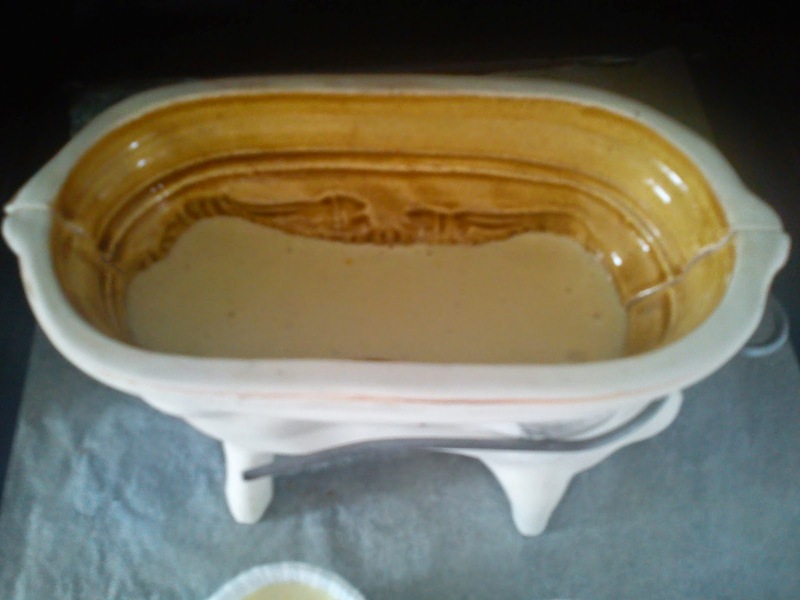 The recipe is called Hjertebrød "Heart bread" as it baked in heart shape oven stable form with a lid on. 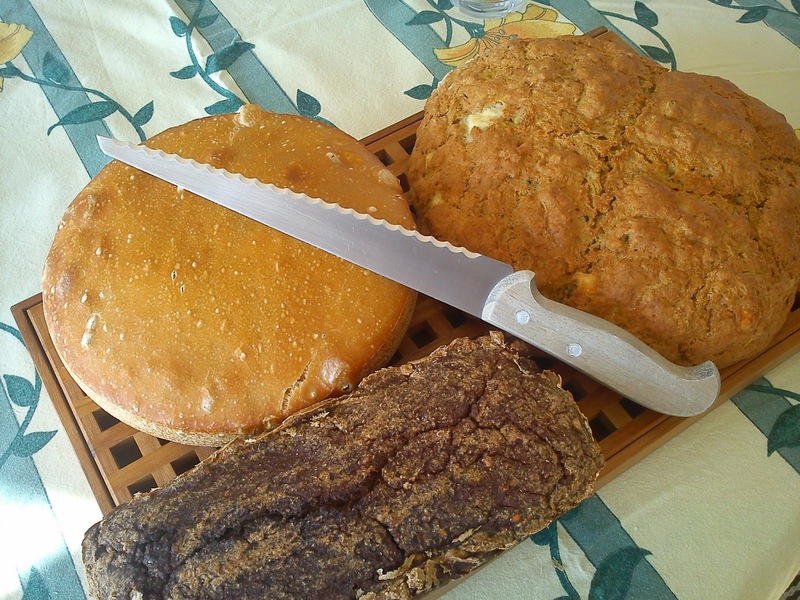 However, as I do not have such a form and as I did not want to damaged my heart shaped cooking pot handle by using it for baking, I used a round form for the baking and therefore ended up with a circle shaped bread. 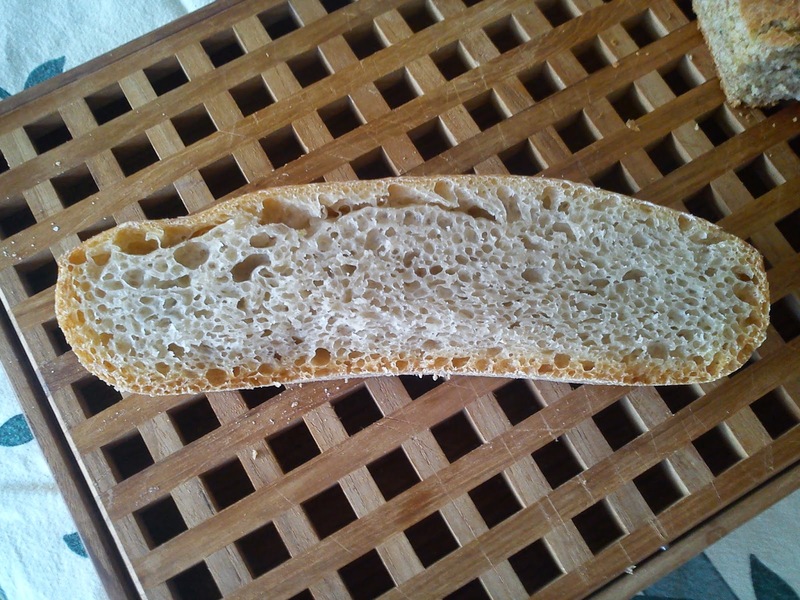 The bread making process involves the use of pre-dough. which is when you let a small amount of yeast, flour and water raised warm 24 hours in advance. When you knead the pre-dough together with the rest of the ingredients followed by 2 times 2 hours raising process, where you after each raising de-gas the dough. After this you let the dough raise for another hour in the baking form followed by baking in the form keeping the lid on during the entire baking process. The taste is great in its simplicity. 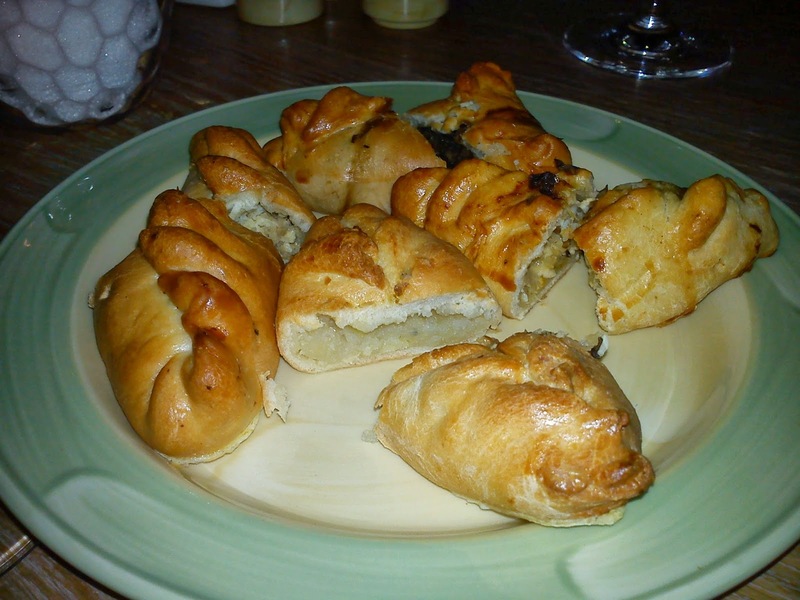 I could easily imaging to work further with this recipe using olive oil, olives, herbs or other things for bringing a taste twist to this bread. Easter is falling late this year, in mid April, so naturally the kitchen theme for April is be Easter (I assume to no big surprise for you). I will be making an Easter calendar for you to follow between 17-22 April bringing you various suggestions, which will involve the use of egg, chocolate and marzipan. Besides from Easter I will on the look out for seasonal things, which you can in nature and use for cooking. On top of that, I will also be planting potatoes in plastic cups for my own home-grown potatoes. Actually Hannibal the Cat and I have been hunting for violet this evening, so a new portion of violet syrup a la Lavender and Lovage can be produced. However, I will also produced something else with violet inside for drink purpose, any clue ? In case you can wait for the Easter Calendar, I will share the two most popular blog posts relating to Easter as a little teaser.